I have a Numbers sheet that is thousands of rows long. As an example in the image, the sheet has two columns with URLs. 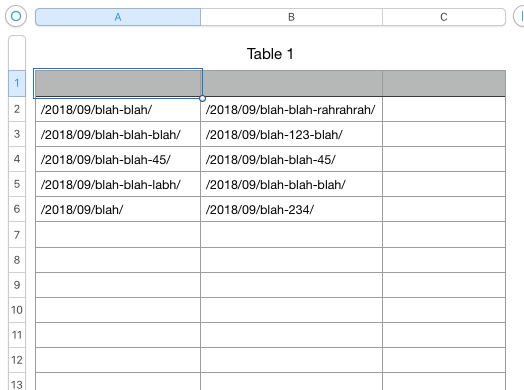 What I need to do is find the rows that have the same URL in the two adjacent cells and then change the background color of that row so I can identify the rows and delete them; or write the word "dupe" to column C. In the example, row 4 has the same URL the two cells. How would I flag or mark rows like that in the entire sheet? With a calculation? Or an Applescript/Automator? use N : application "Numbers"
-- delete -- WARNING: permanent! set the value of cell 3 of them to "SNAP!" I've defined three handlers, highlight(), comment(), and delete, each of which, if called, will perform a particular action upon the rows of interest. Currently, you can see in the script a few lines within the section labelled IMPLEMENTATION: that I've set it currently to perform the highlight() action, which will change the particular rows' background colour to a shade of pink I like. Not the answer you're looking for? Browse other questions tagged applescript numbers automation iwork . In Numbers, how can I determine the default formatting of cells in rows that have just been added to a sheet? How to mark some columns as ignored for calculations Numbers? Is it possible to “lock” and prevent adding new columns in Numbers?